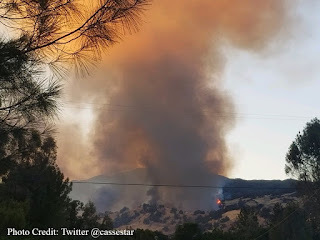 7:26pm #PawneeFire [update] off Pawnee Rd & New Long Valley Rd, northeast of Clearlake Oaks (Lake County) is now 15,185 acres and 95% contained. Increase in acreage due to better mapping. 4:55pm PT Update: #PawneeFire - 2 #VLATs ordered along w/ no divert status on aircraft due to structure/life threat. Hwy 20 is being shut down. It does sound like it has slowed down due to fire running into an old burn scar. 4:13pm PT Update: #PawneeFire - Fire is now near Cougar Rd & appears to be getting close to Hwy 20 per units. 5 type 3 engine strike teams (25 engines) responding along w/ numerous other resources from base. Long range spotting. 3:58pm PT BREAKING UPDATE: #PawneeFire - Fire has crossed the line & is now 100 acres moving towards the Double Eagle area, requesting all available helicopters from base + mandatory evacuations along w/ an air attack + 4 tankers. Multiple spots. Friday Night Update: #PawneeFire update 7 pm. The fire is 65% contained, 13,700 acres and 2,667 personnel. 9:31am PT Thursday Morning Update: PawneeFire is 13,700 acres and 40% contained. 7:03am Tuesday Morning Update: According to CAL Fire, PawneeFire off Pawnee Rd & New Long Valley Rd, northeast of Clearlake Oaks (Lake County) is now 11,500 acres and 5% contained. 7:16pm PT Monday Night Update: 10,500 acres w/ 5% containment, still burning to the east below the reservoir & N/E above Spring Valley. 4:27pm PT Monday Update: Engines, copters are in the Chalk Mountain Rd. area to protect structures threatened by fire. 3:19pm PT Monday Update: Significant runs being made near the dam, fire looking likely to impact Walker Ridge Rd if it maintains this extreme fire activity. Aircraft having issues w/ heavy smoke conditions. 11:16am PT Monday Morning Update: SACRAMENTO – Governor Edmund G. Brown Jr. today issued an emergency proclamation for Lake County due to the effects of the Pawnee Fire, which has destroyed homes, threatened critical infrastructure and caused power outages and the evacuation of residents. 8:45am PT Monday Morning Update: 22 structures have been destroyed according to CAL Fire. 7:12am PT Monday Morning Update: Fire is at 8,200 acres and zero containment. 5:34pm PT: #PawneeFire [update] off Pawnee Rd & New Long Valley Rd, northeast of Clearlake Oaks (Lake County) is now 7,700 acres. 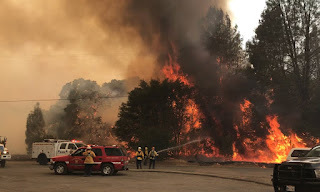 4:49pm PT Update: Bear Valley Rd: 40 structures under threat, fire crews requesting immediate need of 3 C strike teams. BREAKING NEWS: Lake County - Firefighters in Lake County are battling 3,000 acres #PawneeFire (reported June 23rd, exploded to 3,000 acres in just 8 hours) on Sunday, June 24th, 2018.